The women we've profiled on Passerbuys have filled their morning routines with different types of workouts. For most of them, yoga is the best place to start, especially when it can be done at home just by following a tutorial online. When in need of more motivation in the morning or weekends, a yoga class at Sky Ting is the most popular option for getting into shape and feeling good. Jill Lindsey of Jill Lindsey mentions on our Meet the Makers that she spends time at Sky Ting to feel inspired and how it is as a reliable place to wind down. Other more active workouts include pilates and LEKFit for the more experienced. Read on for the full list. No need to bring a mat to the most recommended yoga class among the New York City-based women on Passerbuys like all-around entrepreneur, Jill Lindsey. Open to all levels of experience, Sky Ting aims to bring a kind of yoga with a "medley of lineages." Traditions are borrowed from Katonah Yoga, Taoist, Hatha and Vinyasa. Sky Ting has locations in Chinatown, Tribeca, and Williamsburg. Located in New York City, this place offers hot yoga, and according to its website, "strengthens, tones and loosens the muscles, while calming the mind and reducing stress." With yoga being one of the most recommended forms of working out on Passerbuys, this class will help with your new exercise routine. With locations in New York and LA, Y7 has a recommended yoga for a signature Vinyasa class to the soundtrack of the latest hip-hop beats. LA passerby Victoria Hoff says, "I'm also a big fan of Y7 yoga. I really love the fact that it's completely dark with amazing music, so you can just kind of zone out and forget everything. It's really meditative." Writer and editor, Victoria Hoff, says of this LA-based workout, "I like to mix it up a lot, but aside from my regular hiking in LA, right now I'm really loving LEKfit. It's a trampoline-based dance cardio workout. I'm so not a cardio person (or dance, for that matter), but they're so much fun and such a good workout. They're also available to stream online from home which is really nice." This exercise bike for your home to mimic the feeling of an exercise class. Web designer Folasade Adeoso uses her Peloton as part of her morning routine to feel good throughout the day. There are several packages with the bike starting at $2,245 with delivery and installment. With various locations in NYC, LA, DC, and Boston, you can book a class at this studio specializing in high-intensity rhythmic cardio, and no dance experience is necessary. With a live DJ in session, this workout class is for those who want to have fun while doing cardio. This yoga-barre studio and community space is an empowerment hub in disguise, with not only their signature barre and vinyasa hybrid class (SHAKTIBARRE), but also yoga and Kundalini (other movement classes) plus events, mentorship, and trainings (a.k.a. educational experiences). A second location will be opening in Harlem this fall. Web designer and NYC Passerby Folasade Adeoso says, "Last summer I found a Groupon for kickboxing and fell in love with the sport. 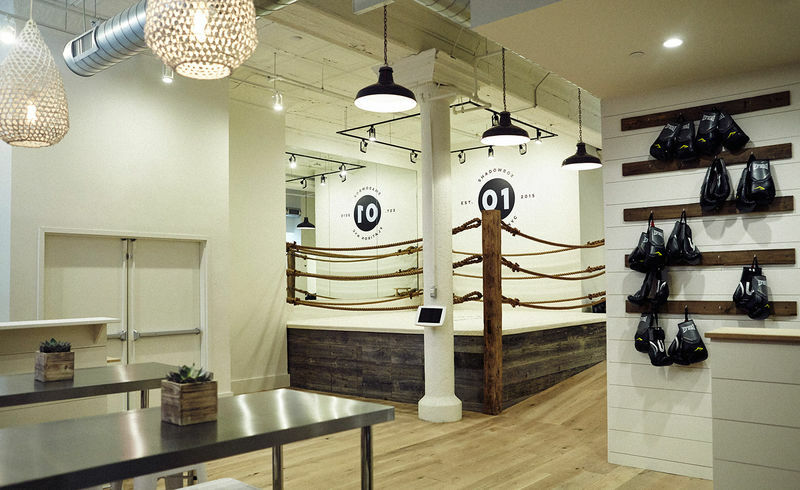 I took kickboxing classes at the Mixed Martial Art Center in Tribeca for a month. I was really into Shadowbox. Shadowbox is a group boxing workout class." This place is for those looking for a challenge that focuses on strengthening your core and toning your body. Fashion editor and NYC passerby Kristi Garced says, "SLT is pilates on crack and absolute torture, but gets the job done." This NYC-based exercise studio specializes in dance cardio and muscle toning classes. It utilizes trampolines and suspended straps for a workout that makes sure you never get bored. With locations in NYC and LA, this group exercise class aims to have your muscles moving with no stress on your joints. This boutique fitness class also includes cardio and focusing on specific muscle groups to strengthen the body. Other workout recommendations include Lucent Yoga (as recommended by Sara Radin), Woom Center (as recommended by Susan Alexander), Namastuy Healing Collective (as recommended by Naiylah Warren) and Xtend Barre (as recommended by Melissa Flashman).